The cliché advice when we go for job interviews or doing a performance is to think of the audience or the interviewers with no clothes on, or think of them on the toilet. Someone once said to me that another technique is to imagine the person smaller. This poem is about that really – the fallacy that size or lack of it can make someone less frightening. But also about power, and who has it and who doesn’t. How sometimes power that looks like power can be not-power, can be something else. The power to make someone smaller, to diminish them, to make them a character of black/white, good/evil, to make something simple, sometimes isn’t power at all. In Ovid’s version of the story of Thetis, who is a shape-shifter, a goddess of the waves who can become any animal or bird that she chooses, is promised in marriage to Peleus, against her will. Peleus catches her in a sea-cave and binds her, waiting while she changes into hundreds of different shapes before she eventually gives in and submits to him. Sometimes the power to change is no power at all either. Today I make you into the world’s smallest man. on the great landscape of my palm. and your head rests below my index finger. and shout surprise! But you do not mean surprise. of an insect. Now you can walk upside down. so small you are living on my skin. And, once I breathe, I breathe you in. I’ve had a rough day today. I’ve spent most of it in bed with a horrible cold. I’ve been ignoring this cold since Thursday but I succumbed today and spent the morning feeling very sorry for myself. I didn’t get to do my usual Sunday run this morning, and I’d planned to go to Keswick to meet up with my cousin but I couldn’t drag myself out of bed. I’m feeling a little bit better this afternoon. I’m terrible at being ill – I’m impatient, and I get bored easily, and I feel guilty when I’m not doing something useful. So spending a whole morning in bed was awful. I’ve been in touch with Treloyhan Manor Hotel in St Ives and there are only 6 places left for the February 2017 Residential Poetry Course I’m running there with co-tutor David Tait. Our guest poet who will be reading mid week is the fabulous poet Penelope Shuttle. If you have been thinking about coming, I would suggest booking sooner rather than later – places will be limited to 16 and they seem to be selling quite fast. Last weekend I was Poet in Residence at Swindon Poetry Festival which involved running two workshops, giving a poetry reading and then just generally hanging about and chatting to people (yes that really was in the job description!) If you are looking for a small, friendly, slightly madcap poetry festival full of quirks, whacky ideas and things you probably won’t find at any other festival in the UK, then I would recommend Swindon. It’s run by my friend Hilda Sheehan who is a brilliant poet herself, and whose enthusiasm and humour gives the whole weekend a unique and wonderful feel. On the Friday night of the festival, I was released from my Poet in Residence duties as I had a reading at Winchester Poetry Festival. I was reading with Ian Duhig and Sophie Hannah. I loved reading with these two poets – I’ve read with Ian before, and he is one of those rare poets who actually has ‘Greatest Hits’ poems – like his ‘From the Irish’ poem – it doesn’t seem to matter how many times I hear it, I still enjoy it. It was great to hear him read from his brand new collection of course, as well. And Sophie Hannah – I bought one of her Carcanet collections when I was first starting to write poetry. She has a wonderful and funny way of looking at the world – one of my favourite poems of hers that she read was about ‘people who flounce off’ – her premise being that there are people that flounce off, and people that don’t, and she is one of the people that don’t flounce off. And where, she asked do the people who flounce off go to? I went to a fascinating Close Reading by Frances Leviston on a John Berryman poem and a brilliant talk by Sinead Morrisey about researching her grandfather’s life as a Communist in Belfast. I was also really pleased to meet up with a poet who I first met on a residential poetry course that I ran in St Ives. We went to a stall and got some thai food and sat on a bench in the town centre to eat our food before going to the reading. This was a new experience for me as I usually like to sit in a cafe and drink endless cups of tea whilst eating, but I quite enjoyed it and it meant we got to the reading in time. I got up nearly every morning at 7am when I was in Swindon and went for a 5k run around Coate Water Park. There is a lovely old diving board in the middle of the lake which I’m told nobody uses anymore and a path right round the lake which was perfect for running. I don’t really like running on my own though and it was a relief to get back this week to going out for a run with my usual group of friends. One of the highlights of Swindon Poetry Festival for me was seeing a few close friends perform. I saw Roy Marshall read from his new collection, and was really impressed, both with the poems and his delivery, and then my friend Keith Hutson did a fantastic hour long show using material from his new pamphlet Troupers, published by Poetry Salzburg. I asked Keith if I could post up the first sonnet here this weekend which he kindly agreed to. I think this is a lovely poem, and the way Keith handles the rhymes, using half rhymes, and slant rhymes is great. This poem is funny – look at that line ‘Some critics called it/nothing but self injury with rhythm’ and the mention of the character called ‘Tom Platt and his Talking Pond’ is great – what on earth was the Talking Pond and how did he get it on stage? We’ll never know – well not unless you ask Keith, who probably does know. My favourite bit about the poem though is at the end, with the mention of running, not just running but running ‘on joy alone’. When I read that, I thought, yes, I’ve done that, I’ve ran on joy alone. In fact, only a couple of weeks ago, I was 8 miles into a hard, tough, hilly 12 mile run, and I got to the top of a hill and the view made me spread my arms wide as I ran down the hill, and it felt like I could take off, even though I was exhausted,that was joy. So, below, you will find this joyful poem, by my mate Keith Hutson, whose enthusiasm when he is performing is infectious. Keith used to write for Coronation Street and his poetry has been widely published in journals such as The North, The Rialto, Stand, Magma, Agenda and Poetry Salzburg Review. He delivers poetry and performance workshops for The Prince’s Trust and The Square Chapel Centre for the Arts. Keith will be appearing as the guest poet for A Poem and a Pint on the 19th November 2016 at The Laurel and Hardy Museum. I hope you enjoy the poem! nothing but self-injury with rhythm. no less, to come back, all is forgiven! did those who knew no better split their sides? He must have made an impact deeper down. heels bouncing bum-high; if that’s what you’ve known. Evening folks. I am so excited about my Sunday Poem this week that I can hardly bear to tell you any other news – then again, I haven’t got that much so that is ok! On Friday I read at the Brewery Arts Centre with Gill Nicholson and Mark Carson – two lovely poet friends, who I realised as I got up to do my set, were at the first writing group I ever went to, so have the dubious honour of being some of the first people to ever see one of my poems. So this is all their fault, I think! Anyway, they were lovely and encouraging to me, so it was wonderful to read alongside them on Friday. Pauline Yarwood, another lovely poet-friend was the MC for the night, and she did a great job – her introductions were warm and generous and full of enthusiasm for poetry, real enthusiasm, which as we all know is contagious and is what we need more of in the world. I read some new poems and broke out from my usual set that I do from the pamphlet, which was both scary and liberating. Reading from the pamphlet is like putting on a pair of comfy shoes – I do the same poems in the same order – but Friday’s reading made me realise that it is ok to shake it up a little bit! I have had a great week for selling books – I sold six on Thursday in Carlisle and the bookshop took five to sell, which I am very grateful for as it is hard to get my poor spineless pamphlets onto a shelf, and I sold six on Friday in Kendal and then two through my lovely paypal button on this blog this week which takes my grand total to 406 copies sold! Da da! I’ll let you all know again when/if I get to 500….. But! Off this unimportant stuff – and lets face it – it is not that important really – not compared to finding a poem that makes you wish you had written it – that makes you read and re-read it to get to the heart of it, and then realise you won’t get to the heart of it, and that’s kind of the point…and I have such a poem as my Sunday poem this week! When I was shortlisted for the Michael Marks a week or so ago, it jolted me into ordering some pamphlets that I’ve been meaning to order for ages. One of the other shortlisted poets was Chrissy Williams with her Happenstance pamphlet ‘Flying into the Bear’. I read the first poem, and became a bit besotted with it. Maybe it is because that bears slip in and out of Chrissy’s poems in the same way wolves lurk at the edges of mine – but it also has something to do with the beautiful language and the inner logic of the poem that holds it together against the more rational logic of the outside world. I hope you enjoy – let me know what you think! I asked the artist to draw me a heart and instead he drew a bear. Good morning everybody! Arrgh, it’s already the last day of the Easter holidays! The weekend doesn’t count you see, that’s the weekend. This is the last day that I can sit and think, what SHOULD I be doing today – hmm, nine o clock Friday, I would be doing a half hour lesson in a primary school for two trumpets, one cornet and a baritone player. Today I’m off to Glamorous Glossop to visit the lovely Liz Venn. Apparently there will be red wine and bolognese. Tomorrow morning we are both going to the Poetry Business for our next Advanced Writing School workshop. This has two advantages – I don’t have to get the train at 6.20 am on Saturday morning and I get to see Liz! And because yet again, there is a replacement bus service on the train line I can drive back with Jenny Copley to Barrow and get back at a reasonable time. So I’ve been vaguely taking part in National Poetry Writing Month – which is where you join a group and write a poem a day. I’m part of a ‘secret’ group on Facebook and I am a guest prompter which means I have to do a couple of prompts on certain days to set people off writing poetry. I feel like I’ve already written about this in a previous post – sorry if I’m repeating myself! Anyway, I’ve been reading other people’s posts, sometimes commenting, mostly being a silent, lurking observer, but what I have done all week is to basically sit in my pyjamas for most of the day and read poetry. I went to the remainder bookshop in Sedburgh and got lots of brand new poetry books for half price and I’ve just been reading through those. I made myself a nest and a flask of tea so I didn’t have to keep getting up and just sat and read. So poets I’ve read this week include Phillip Gross, Heather Williamson, Peter Levi, Lucie Brock-Braido, Esther Jansma….I haven’t read all of these cover to cover – I’ve been kind of dipping in and out. I’ve been playing Lucky Dip with the Poetry Archive whilst doing the washing up. I learnt a Don Paterson poem off by heart. I’ve written one poem which I think might be worth going on with and maybe five rubbishy ones. I’ve done a map of my first collection which you can see below. The boxes are themes and the little bits of writing are poems and I’ve done lots of spidery lines all over the place to see how they join up with each other. I thought a lot about whether I should add little bits about the collection in between these conversations with other poets and I decided I would, although it feels strangely revealing and private to do so. I know where there are gaps in the collection now, where I need to write more poems. Last night I went to an April Poets event in Lancaster. I’m really glad I did bother myself to get out of my nest and my pyjamas because it was a really nice event. The room was packed with audience which is lovely to see – the open mic was great and the invited guest poets – Michael Crowley, Pauline Yarwood, Carole Coates and Judy Brown were varied, interesting and entertaining. I had a chat with poet Antony Christie in the bar and from this very short conversation I think I’ve pinned down the first poem in my collection. So this is how I’ve decided to ‘do’ National Poetry Month – pretty much what I do all the time, but more of it. Lots of reading, a little bit of writing, and getting out and about as much as I can to see what else is going on with other poets. They host events twice a year, and they are always fantastic and very well organised. The next one is in November – I don’t know who is reading yet, but keep your eye on the website. It’s half term week this week, and I’ve been lounging around for a lot of it. On Monday, I spent the day editing the Holland Haul Anthology, which is the anthology that comes from the course I went on with Second Light. Each course member can contribute a poem to the anthology. 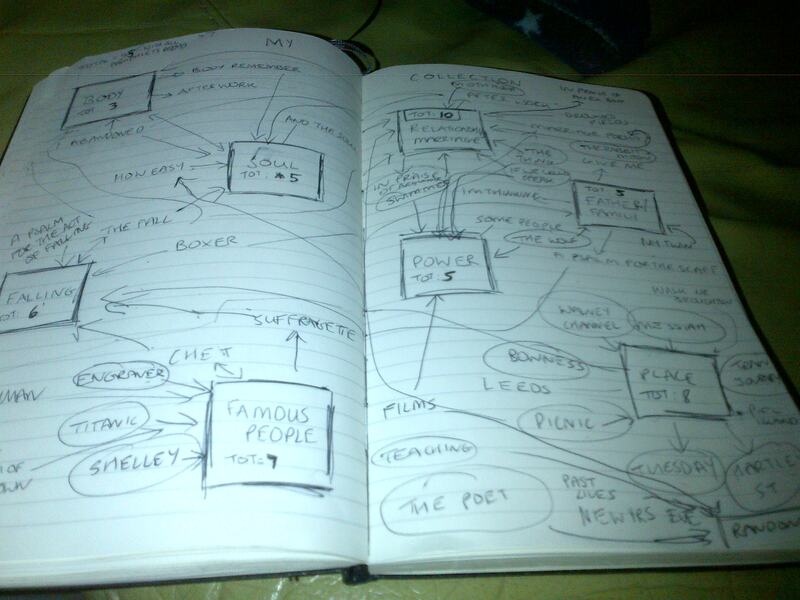 On Tuesday, I started to plan my first poetry workshop that I’m going to run in a school – it’s on the theme of Riddles, and I’m really starting to look forward to it, especially now I’ve got a basic outline in my head of what I’m doing. I’ve now read 83% of John Burnside’s ‘A Lie About My Father’. At the very beginning of the book, he talks about Halloween being a time that ghosts find their way home – and today, as I was walking the dogs round Millwood in the rain, it was easy to see how he could believe that. The path was carpeted with leaves, and it was just starting to become dark – the type of dark that it feels like it’s trying to fool you, and arrive without you noticing. There was nobody in the woods today – maybe they were all getting their halloween costumes on, or sensibly didn’t want to get wet – and there were these crows or rooks going crazy in the trees across the railway line. They would fly around in a circle and then land in the trees again, and then take off, shouting and swearing at each other. I love the way Burnside writes, but the last part of the book is taken up with talking about his drug and alcohol taking, and I’m starting to feel my attention wandering, but then he brings it back with something interesting. For example, at the minute he is talking about how long it takes a person to fall, and how if you find someone who is ‘falling’ at the same time as you, you get on well. He also talks about this ‘other’ who he feels has walked next to him all his life – and this idea really opens up his poetry to me – his poetry is full of a strange ‘other’. Bookings for the Abbot Hall Residential Course are going well – we’ve already got the minimum number of participants, which is a relief as that means the course will definately go ahead – so if you are interested, please get in touch. Friday night I’ll be at the Brewery Poets reading at the Brewery Arts Centre in Kendal, introducing Patricia Pogson and Carole Coates – really looking forward to that event. And then its all day rehearsal Saturday and Sunday at Phantom of the Opera at The Lakes school. We had a rehearsal last weekend and I really enjoyed it. My twin sister is playing French Horn and we haven’t played together for ages. It reminded me that I do love playing. And next Tuesday, I’m really looking forward to because it’s Carola Luther’s launch of her new pamphlet ‘Herd’ at the Wordsworth Trust in Grasmere. And finally, strange search term of the day that brought some poor lost soul to my blog ‘where do you get dismantled bits of rocking horses’. Hope whoever it was found a bit of horse somewhere. Getting the Sunday poem in pretty close to the wire! But I’ve been at the Dorothy Wordsworth Festival of Women’s Poetry all weekend. More about that in a later post. It was one of the few poetry readings I’ve been to where the organisers had to get more chairs out! People had turned out in force to support Mike. I think this was for two equally as important reasons. Firsly, he is a great poet, as you will see from the poem below, which is one of my favourites in the collection, but secondly, he is such a lovely guy, in fact he is reknowned for being generally nice. You’ll know what I mean if you know him! Let me know what you think of the poem! before I’d had a chance to smile. against the heels of the person ahead. I knew their words by heart. and a tiny muscular dog which sniffed my toes. and tucked into crisp hospital corners. I held the door for childhood. I held the door for history. a punter in a hall of mirrors. I held the door for tomorrow. on my brow, the creases down my cheeks. but it seemed reluctant to go in front. The start of the Easter holidays. I have deliberately planned absolutely nothing this holiday. This is mostly due to being ill in the last two weeks of term, and then not really recovering in that last week of term, due to the usual madness and chaos of the last week. The hubby went away to Scotland on Friday for five days of walking and sleeping in a tiny tent at the top of a mountain with his friend, which leaves me with the house to myself for the first time in absolutely ages. So far, I’m quite enjoying it! On Saturday, I went to The Beach Hut gallery at Kents Bank, Grange over Sands with the wonderful poet Jennifer Copley www.jennifercopley.org.uk , to organise running a workshop at the gallery. Her husband, Martin Copley exhibits his sculptures there. It is a very small gallery, I think we should be able to get ten people plus the two of us around the table, but they have some really lovely things there and Ithink it’s definately worth a look for a birthday or christmas present shopping spree. The workshop will be 15 pounds per person and will run from 2.00pm till 4.30pm on National Poetry Day which is Thursday 4th October. Which is also my birthday! If anyone reading this would like to book a place, please get in touch via the contact page. In the evening, we are going to have a poetry reading at Abbotshall Hotel in Grange Over Sands, which is just down the road from the gallery. It will be four pounds to get in, unless you’ve been to the workshop, in which case you can come in for free, and we hope, will read something that you’ve written in the workshop that day in an open mic slot. Jenny and I will be reading for 15-20 minutes each, and the rest of the time will be open mic slots. I’m really looking forward to the workshop – the gallery is perched next to the train station, right next to the sea, so there are stunning views, as well as lots of quirky art work which I’m hoping will prove to be an inspiration.